Be the first to share your favorite memory, photo or story of Joni. This memorial page is dedicated for family, friends and future generations to celebrate the life of their loved one. 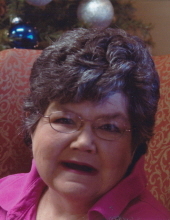 Joni L. Thurmond, age 56, of Sullivan, Missouri, passed away Thursday, March 21, 2019 at Meramec Nursing Center in Sullivan. Joni Lee was born on January 8, 1963 in St. Louis, Missouri, the daughter of Dale and Estalee (Clonts) Thurmond. She grew up in Sullivan and graduated from Sullivan High School. Joni had a sweet and pleasant personality. She was very creative, had a vivid imagination, and was a great story teller. She loved watching sports, especially Cardinal’s baseball and basketball. Joni loved her family very much and looked forward to their visits. She enjoyed receiving her favorite gift, which was, Missouri Lottery scratch offs. She will be missed by her family and friends. Joni is survived by her brother and sister, Kevin Thurmond of Sullivan, MO, and Gina French of Bourbon, MO; niece and nephew, Todd Krygiel and Shelly Krygiel; great nieces and nephews; aunts and uncle, Myrl Bledsoe of Sullivan, MO; and Viola and Tom Bryant of Sullivan, MO; other relatives and many friends. She was preceded in death by her parents, Dale and Estalee “Sis” (Clonts) Thurmond; and a nephew, Michael Krygiel. Memorial services will be conducted 11:00 AM, Wednesday, March 27, 2019 at the Eaton Funeral Home in Sullivan, with Pastor Carl Duff officiating. Inurnment will be in I.O.O.F. Memorial Cemetery in Sullivan. The Thurmond family will receive friends from 9:00 AM to 11:00 AM, Wednesday, at the Eaton Funeral Home in Sullivan. Friends may send online condolences to the Thurmond family at www.eatonfuneralhome.com. To send flowers or a remembrance gift to the family of Joni Lee Thurmond, please visit our Tribute Store. "Email Address" would like to share the life celebration of Joni Lee Thurmond. Click on the "link" to go to share a favorite memory or leave a condolence message for the family.